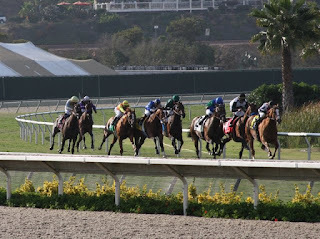 Today was for me, with a visit to the what I consider the best thoroughbred meet in America - Del Mar Race Track. The entire family had a good time. 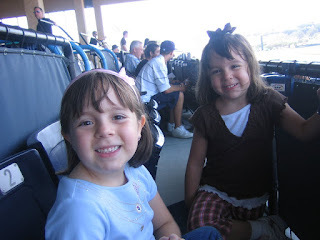 They have quite a few kid activities in the infield that kept our kids occupied. Black Mamba rallied hard to win the $400,000 John Mabee Handicap. 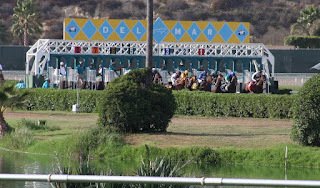 Horses leaving the 1 1/8 mile turf chute. Black Mamba is on the right. accelerating for the stretch run. She won. I came out at the end of the day with only a slight loss but, I wasn't completely focused since I was trying to keep my wife and kids entertained. 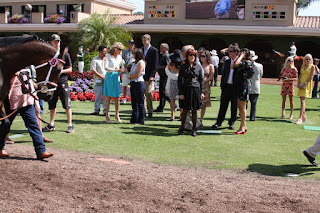 They love horse racing but, they just think the 30 minutes between races is incredibly boring. I am quite the opposite. In those 30 minutes I have to look over the racing form so that I can change my mind from the previous night's studying, I have to watch the post parade and then go make my wagers. 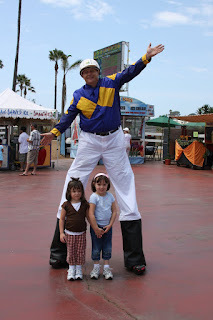 I limited my bets at Del Mar to WPS and exacta boxes. I did get to briefly meet Brad Hennegan, director of the award winning documentary "The First Saturday in May," and, horse trainer Dan Hendricks, who has a storyline in the movie. Although, Dan was recently paralyzed (2004) in a motocross accident he still continues to train thoroughbreds. 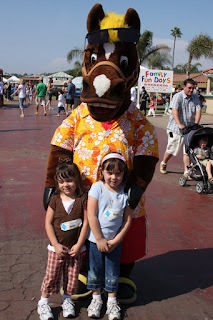 Both of them were at Del Mar to promote the documentary. Dianna also got to see Jenny Craig. She is in the photo below wearing black since her husband, Sid, just passed away a couple of weeks ago. Sid once gave Jenny a $2.5 million race horse, Dr. Devious, as a birthday present. This horse went on to win the Epsom Derby in early '90s. Before the track we drove through Del Mar (the town), Solana Beach and Encinitas. Lots of cool shops and places to eat. There were people enjoying the outdoors everywhere....I have never seen so many cyclists and joggers....all of them traveling along the coast. If it wasn't for the cost of housing this would rank as one my top places to live with my wife and kids. The weather has been perfect so far; it sure does beat the 107 degree heat back in North Texas. Most of the beaches in this area were filled with surfers. The wave action was perfect, if you own a surfboard. Solana Beach is the site of a shark attack earlier this year that garnered a tremendous amount of media attention. After the races we attempted to eat at Tony's Jacal but the wait was 1 hour....we just left the track too late but, I wasn't going to miss the feature race. I had a rack card for a restaurant called Cafe Coyote. The card mentioned they were voted 'Best Mexican in San Diego' so, we gave it try since it was somewhat close to our hotel. This restaurant was located in San Diego's Old Town district and had a touristy feel to it. It wasn't bad but, I won't be visiting this restaurant again. I don't believe for a second that this is the 'best' food in San Diego. I think someone has been stuffing the ballot. You can check out the details (soon) in my Mexican food blog. Was Jenny Craig in the blue or the black?...if it was the black, kind of looks like a Ronald McDonald-esque linebacker who isn't using "her" own product. She is in the black....she is also in her mid 70's.